Caring for your Christmas house plants, our plant of the month; Prunus serrula, perfect pairing (2 plants that go well together); Hamamelis mollis and Sarcococca hookeriana var. digyna, listener's questions and jobs to do in the garden this month. File Size: 14.6 MB, Duration: 31' 45"
In this month’s edition of the podcast we discuss seasonal gardening jobs to do in the garden during the month of December and a selection of plants that look good at this time of year, including the ubiquitous Christmas house plants the Poinsettia and the Christmas Cactus. 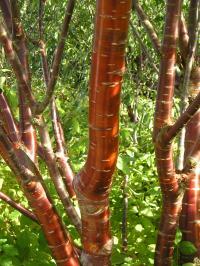 Plant of the Month - 05' 45"
Our plant of the month for December is Prunus serrula also known as the Tibetan Cherry. Perfect Pairing - 08' 40"
Jobs in the Garden - 12' 47"
In the Vegetable Garden - 17' 41"
Plants of Note - 18' 27"
Listener’s Questions - 22' 10"
Faith Perry - I cover my clematis when frost is forecast. Can I just leave it covered even though the weather improves? Also, does it need a double thickness of fleece or will a single one be sufficient? It is beautiful but hard work when I have to go out and cover it each night that a frost is forecast. Izabela Russell - Why are my strawberries and snowdrops coming up in November? David Bradbury - Do garden fertilisers - bonemeal, blood and bone etc. have a shelf life?